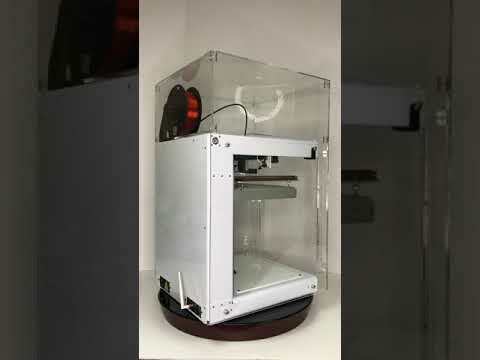 ODESSA, FL, September 28, 2017 /24-7PressRelease/ -- In an effort to ensure 3D printing enthusiasts maximize the use and lifespan of their top-dollar machines, Ultimate 3D Printing Store has created a clear enclosure designed specifically to cover and protect Type A Machines' Series 1 Pro 3D printer. "Our design and engineering department worked closely with industry experts to create a state-of-the-art, custom-fitted enclosure that mounts directly to the existing frame," said Roy Kirchner, founder and president of Odessa, FL-based Ultimate 3D Printing Store. The enclosure, which costs $399.99, can be paired with an optional HEPA filtration system and fume extraction system from BOFA Americas Inc. The BOFA system can be added to the enclosure for an additional $799.99. "The enclosure helps to maintain the thermal consistency within the printing environment, which can result in better printed parts," Kirchner said. "With the development of more exotic material requiring controlled environments for printing, this was the next logical step." Ultimate 3D Printing Store designed the enclosure to break down to allow for easier and safer shipment. The enclosure comes apart, and lays flat, which allows U3DPS to keep its price low and reduce the risk of damage to any of the components while it is in transit. Customers will need to assemble the enclosure upon receipt, with supplied hardware. In addition, Kirchner said his company can design the same enclosure to be compatible with Type A Machines' Print Pod with the same option to attach a HEPA filtration system. In addition, U3DPS' design department works with manufacturers designing enclosures for their printers as well. The custom-made enclosure is available to purchase online at ultimate3dprintingstore.com. "We're offering it to consumers, and other resellers, because we know how important it is to protect your 3D printing investment," Kirchner said, "and to get the best possible result every time you print a new product."